So, we've recently seen yet another document from a government agency, this time from Infrastructure Victoria big on fluff but light on detail about facilitating suburban CADs, and the hell with it, that's the acronym I'm going to continue using. 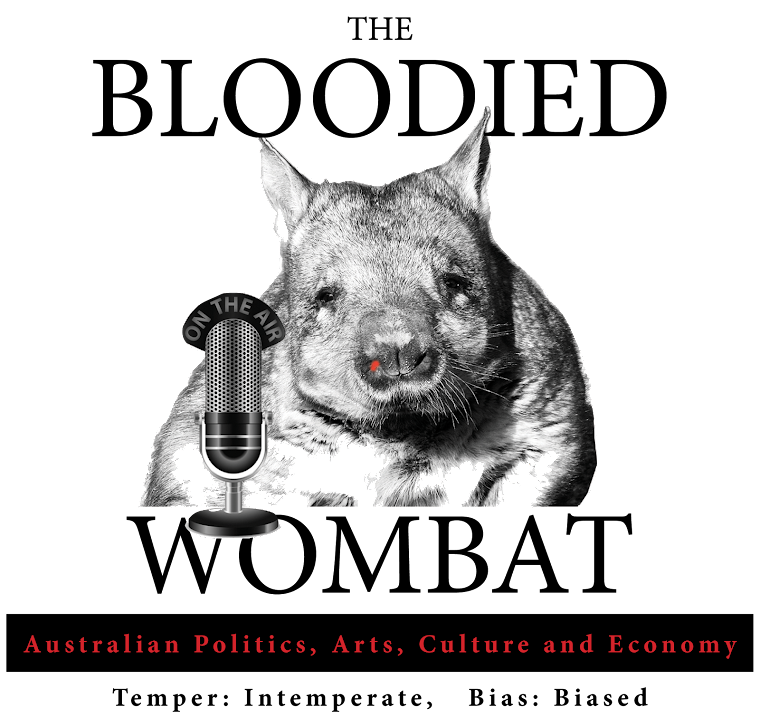 For those who haven't read the previous wombat offering foregrounding all this, I strongly recommend checking out THIS POST first as background to everything that's afoot here. My self-designated mission therefore is an INFRASTRUCTURE agenda that would MAXIMISE the connectivity of suburban CADs, along with their concomitant rail catchments, as well as maximise the dispersal of possible CADs across a wider urban area than is currently planned, and maximise the number of CADs in total. All this based on the assumption that far more investment and a far larger and more dispersed range of CADs than are currently planned is going to be necessary to drive success if we're actually being serious about facilitating "twenty minute cities". And again this on the assumption that the present repetition of mere hot air very specifically WON'T get us there. This in some ways very obvious project involves REPLACING the Alamein line completely with light rail terminating at Camberwell's third platform. This would probably require some kind of flyover for much of the short section of track it would share with the heavy rail network. The light rail would then run under the creek via tunnel then use the above ground reservation from the former Outer Circle Line to Dandenong Road, from there via a new Chahdstone superstop, and then the whole damn way down Warrigal Road to Lower Dandening Road, and from there via Braside to Dandenong and on to Narre Warren, providing a new light rail catchment for the major residential areas into that center. This would run from Huntingdale, or for even better network effect from Oakleigh Station along North Road to Monash Univerity and Monash employment center, and running via Rowville and Knoxfield to Ferntree Gully. This is my cost-effective alternative to doing what we're told will have marginal usage benefits - a heavy rail Doncaster-City link. It may be a little presumptuous in that it assumes a light rail technology that would be able to share the Metro Rail tunnel. Dual track should be easy enough, but I'm not sure how you'd accomodate TWO overhead power systems. Nor how you'd get CBD North and South platforms to accomodate two different modes. Suffice to say for this exercise I've assumed these problems away. If that were not feasible, PTV's network development solution of doing essentially the same thing via SXS would be one alternative. 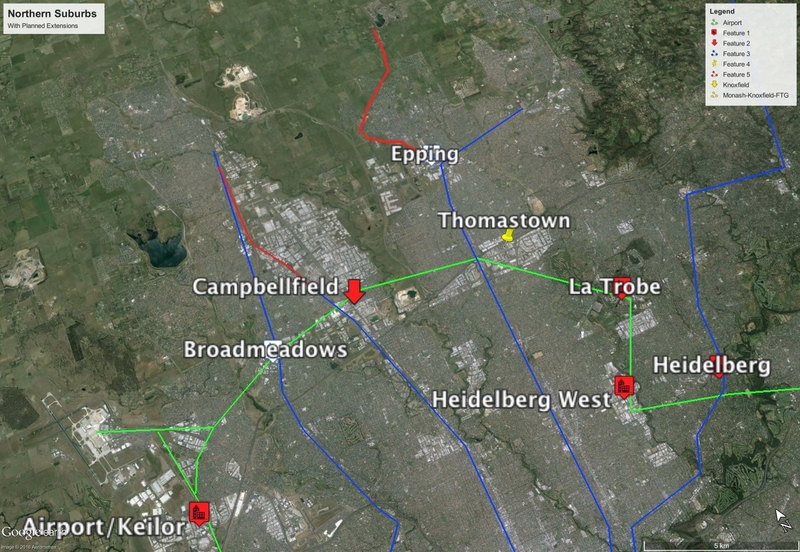 The second issue is that I'm replacing the entire Williamstown line with light rail, but this would also need to share a small section of existing track with Werribee line trains, creating the same issue as above, and which again I'm just going to assume away for now. 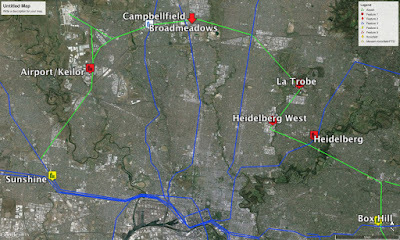 This facilitates Metro 2 through the inner north and Fisherman's bend. 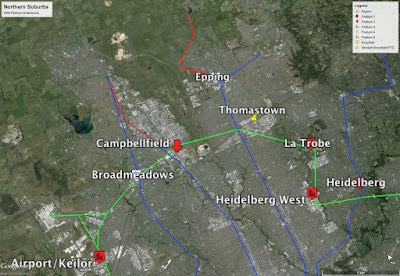 From Newport, we're tunneling through Fisherman's bend - possibly achievable through cut and cover rather than boring, with a Southbank stop at the Casino/Convention Center entrances, it would then either share the metro rail or a duplicate rail tunnel to the CBD North station from where it run to create new stations around Lygon and Brunswick streets before intersecting with the northern group lines at Collingwood, tunneling through to Studley Park Rd and continuing above ground to Kew Junction and then on to Doncaster, largely replacing the existing tram line. Readers who are following closely will note an evolutionary shift in wombat thought about this. Yes, you guessed it, I now want to spend even more money. Obviously this could be staged and start delivering benefits from early in the project, but we'll look at the logistics more shortly. So, the proposal is for a largely underground medium-heavy orbital rail system. One cost-effective approach would be rather than traditional heavy rail, examining the possibilities for incorporating "Medium" rail in the form of Alstom's Axonis technology, and while I don't intend to bog us down in the specifics of mode selection, for anyone interested in the technology, how it works and why it's cheaper, there's an excellent article over at Urban Melborne HERE. So, looking at Plan Wombat by section, we envisage firstly the creation of an airport link via the Albion freight corridor AND via a new orbital Northern and Eastern suburbs line connecting all the major CADs thereabouts. 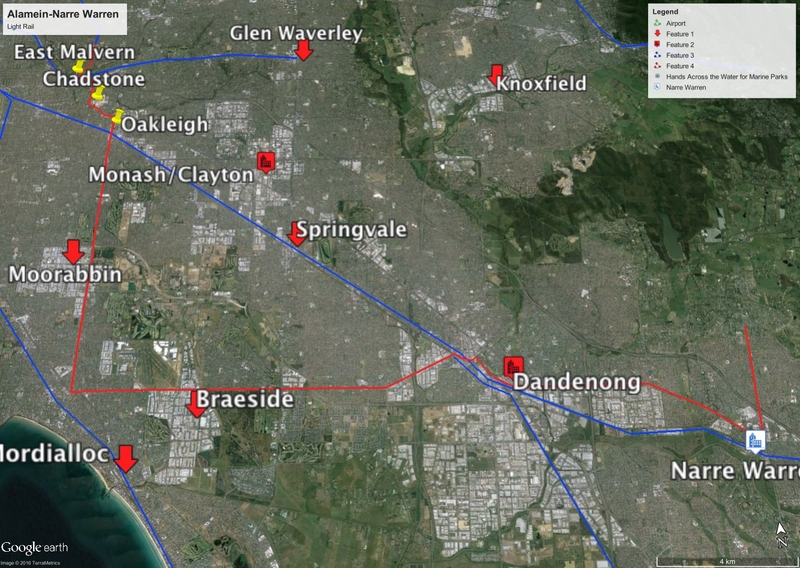 The two proposed lines would run Mordialloc - SXS via Sunshine and Frankston - Airport, with a third SXS-Airport route also incorporated. I very strongly believe we are going in the WRONG DIRECTION looking at longer car sets for the heavy rail network. Because I VERY strongly believe that inadequate service frequencies are one of the present network's major shortcomings. We should be about small car sets running MORE frequently if we're about delivering a network that meets people's needs. In my experience your twenty minute off-peak wait does a lot more to prevent people actually using the network than overcrowding does. 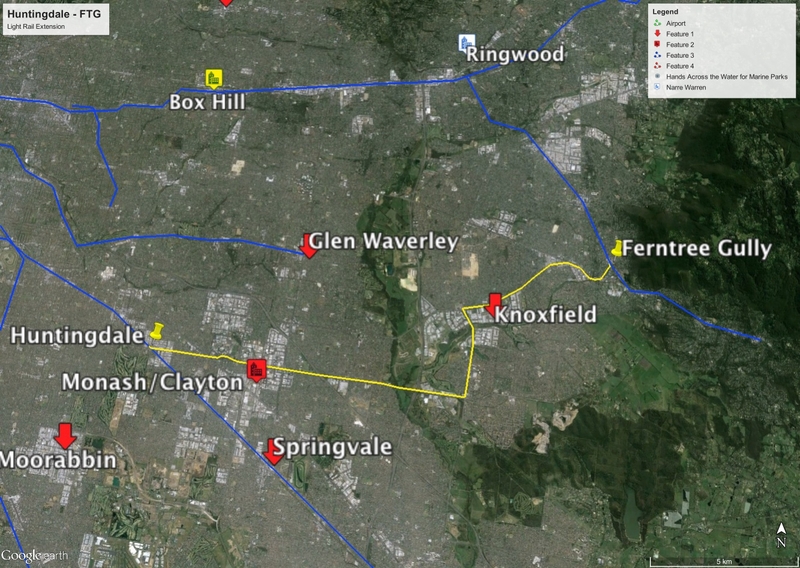 I would envisage this network extension running entirely on three car sets with a metro style service frequency. 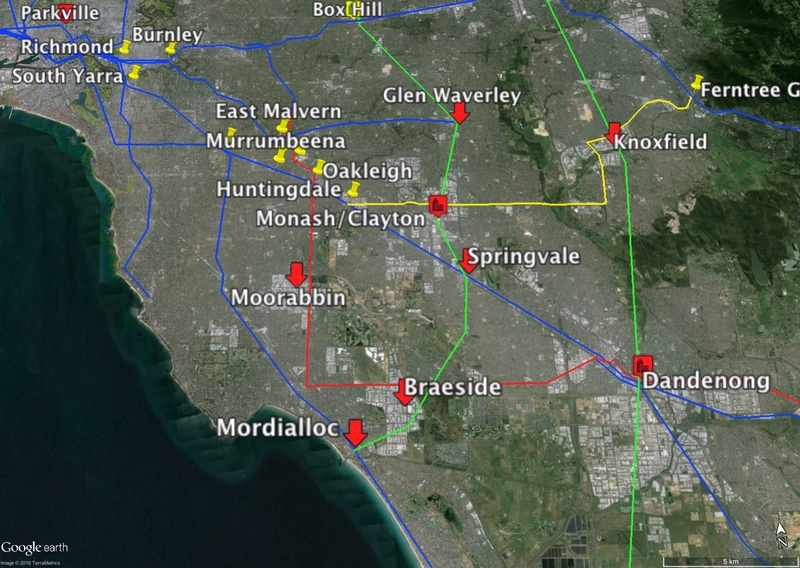 And these statistics here are a little out of date, but this shows that what we're doing with Plan Wombat is connecting - particularly in the outer East is connecting ALL the major existing transit stations. In addition to the facilitation of the CADs shown above, I strongly believe that there are network inherencies that would also advise, based on these centers either having good existing catchments or newly facilitated ones as a non-primary objective for Plan Wombat, the additional inclusion of the following as designated CADs. Costing of these sorts of projects is a can of worms. Switzerland have just delivered 57kms of dual rail tunnel at a cost of AUD$17bn = $0.3bn/km. 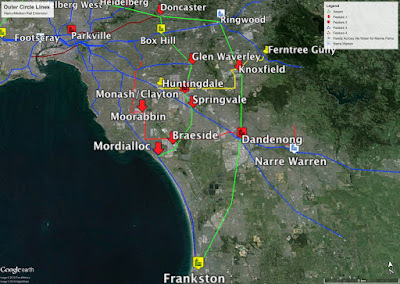 With Melbourne Metro, we're getting 7kms of new tunnel at a cost of $11bn. = $1.5bn/km. So something's seriously screwy here. How do we wind up paying over $1bn/km in Melbourne when the Swiss can do it for a THIRD of that cost, Sydney at HALF? At the recent Melbourne Metro info sessions I did ask their in-house tunneling expert about this. His not particularly convincing response was that geological conditions tend to be the major determinant of project costs. Did you know that almost all tunnel borers are BUILT TO SPEC for their specific projects? You don't hire these things, you BUILD a new one for your project alone, and the technology you use will be specific to the project geography. I would suggest the following staging for the Wombat project, with those stages intended to deliver the highest benefits prioritised first. So at Swiss rates, the heavy rail projects would cost $34bn, at Sydney rates it's $55bn, and at Melbourne, it's an insane $162.5bn. 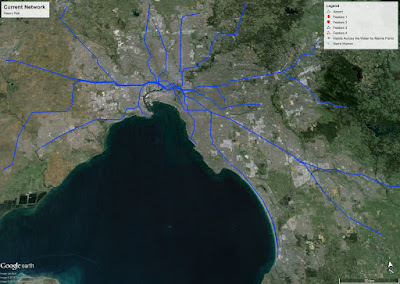 With Sydney Metro argued to have a Benefit-Cost Ratio (BCR) of 2.5, and Melbourne just 1.1, would it be possible to ever get a project of this scope to a positive BCR? That's obviously well beyond my humble capabilities to calculate. But it is obviously THE key question in whether this would have legs. 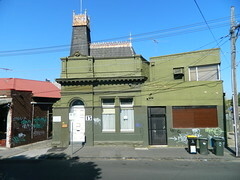 My argument is that the benefits of facilitating suburban CADs through this means is, provided it is predicated on a RADICAL re-working of the city's entire transport and employment patters, such a necessary enabling factor in allowing Melbourne to continue to grow sustainably at the rates that have been forecast, that I think one could mount an argument that costings towards the lower end of the scale WOULD have a positive BCR. So putting all this together, I hope readers will discern that this is a SIGNIFICANTLY more comprehensive plan to enable the desired radical re-working of existing patterns than anything currently on the table. Firstly, I believe it properly prioritises those CADs that have the GREATEST POTENTIAL in a way Plan Melbourne fails to do. Secondly, it addresses all the existing employment centers that Plan Melbourne ignores. And I maintain that if we are SERIOUS about facilitating "twenty minute cities" that there are categorically not enough designated CADs within Plan Melbourne as it stands to facilitate this, as I believe the following table bears out. 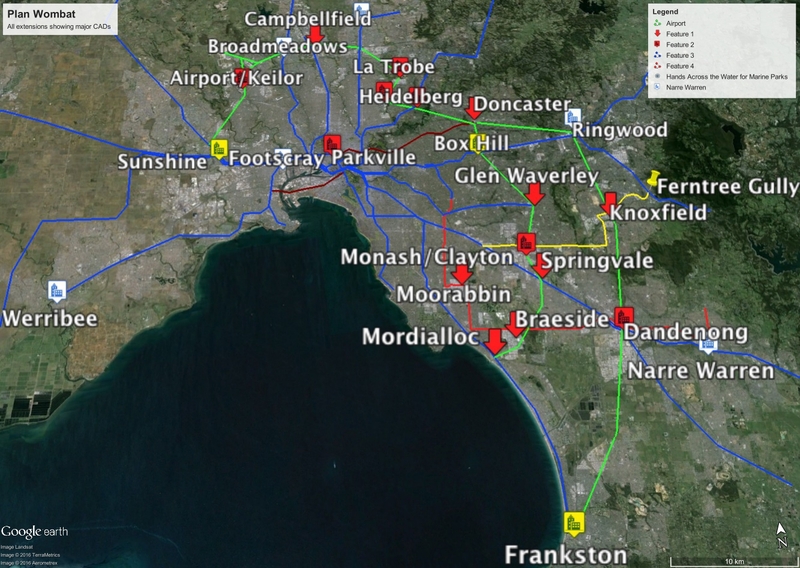 And we can see how vastly improved the catchments into the designated centers would be under Plan Wombat versus Plan Melbourne. 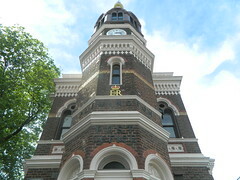 Ringwood is by FAR a better prospect for creating an effective mixed use CAD. 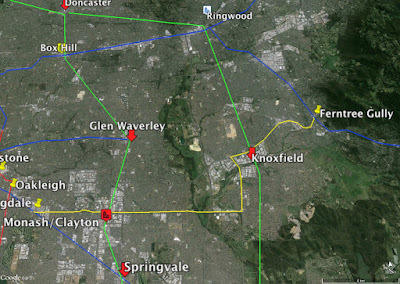 It's shopping center is already larger and better integrated with the rail network than Box Hill's, and under the Wombat plan, it will have full FIVE RAIL CATCHMENTS radiating into it, as the below illustrates. You can clearly see how direct access lines into Ringwood would dominate the majority of the surrounding residential areas, and NONE of the other planned suburban CADs has quite this comprehensive a dominance of its immediate region. 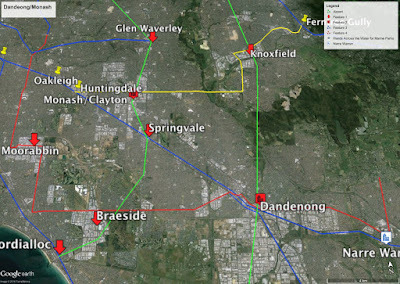 Under the wombat plan, BOTH the Craigieburn and Upfield lines become effective catchments into Broadmeadows and Campbellfield. Especially if the obvious job is done duplicating the top end of Upfield and re-connecting it to the Craigieburn Line. Completing the Epping - Wollert extension similarly extends the catchment for MOST of the designated Northern CADs. 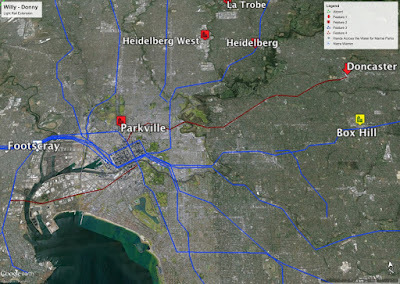 And if there's a train station in suburban Melbourne BETTER PRIMED in terms of the sheer volume of redevelopable land within coo-ee of it I'm not aware of it. 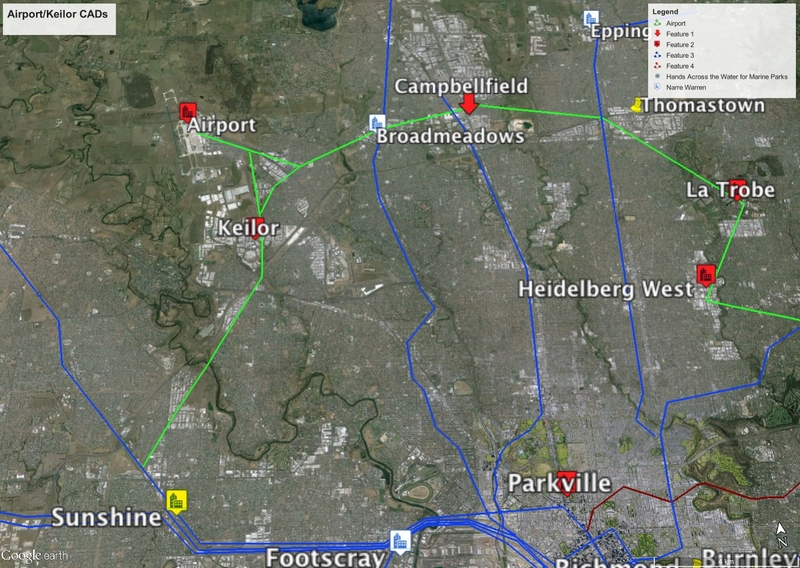 Again the point needs to be made that the airport region is presently Melbourne's largest employment center outside the CBD, and it is entirely unserviced by public transport. 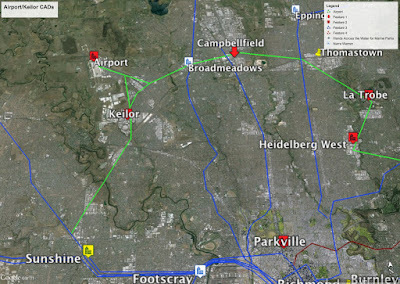 Unlike previous airport rail plans, I am proposing the creation of new commuter stations along the new extension through the Albion corridor, again because the entire point of Plan Wombat is primarily allowing WORKERS effective public transport options to their workplaces, catering for airport commuters would be a SECONDARY concern. Rail projects need to be completed so that passengers could be able to travel in it and enjoy their train journey. As soon as this light rail project is complete including the way for the airport, it will be great for travellers and passengers.